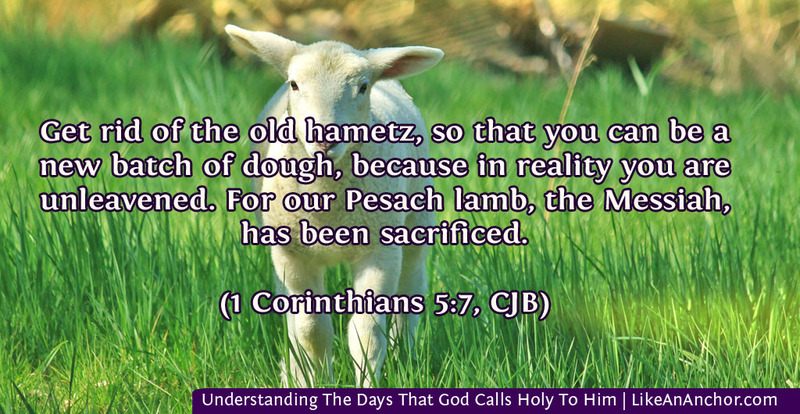 Did you know that there are certain days in the Bible that God calls holy? One of these holy times happens every 7 days and we call it the weekly Sabbath. The other 7 holy days happen at set times in the spring, early summer, and fall. If you’re reading this when it was posted, the fall holy days ended a couple weeks ago and the spring ones won’t start again for 6 months. This in-between time seems to me like the perfect opportunity for those of us who do keep the holy days to reflect on their meaning, along with how and why we keep them. And if you’ve never observed God’s holy days before, I hope you’ll find value in learning about them and maybe even join us in keeping them. 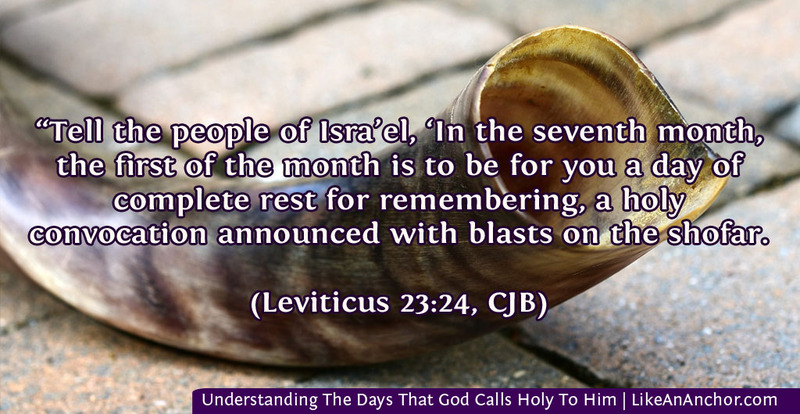 All the holy days are outlined in Leviticus 23, and then expounded on in other passages as well. In this chapter they’re all called “set feasts” (mo’ed) and “holy convocations (miqra). This identifies them as appointments that God has set at specific times for specific reasons. We talked about these Hebrew words, and others that describe God’s holy days, in last week’s post (click here to read it). As spiritual Israel (Rom. 9:6-8; Gal. 3:29; Eph. 2:12-13), this covenant is transferred to us (see post “Inheriting Covenants“). 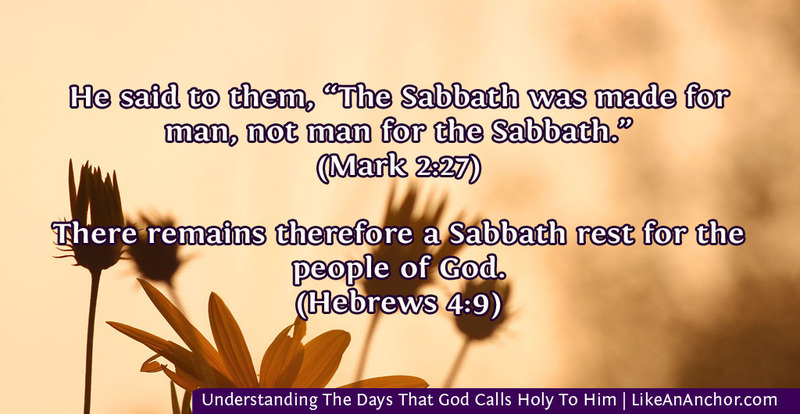 The author of Hebrews talks about this from 3:7 to 4:9, which concludes, “There remains therefore a Sabbath rest for the people of God.” The Greek word sabbatismos literally means “keeping Sabbath” (G4520, Thayer’s dictionary). The Sabbath (which happens every Saturday) is a time when we stop doing work and other things that clutter our weeks and enter God’s rest. It’s a time to gather with other believers in God’s presence, to learn from Him, and take on His delights as our own. The Sabbath reminds us of His plan, purpose, and presence, and let’s us practice His rest. The Passover (Pesach in Hebrew) observance was instituted in Exodus 12, and Israel was told they should keep it and the Feast of Unleavened Bread that followed “throughtout your generations by an ordinance forever” (Ex. 12:14, WEB). Jesus changed/added to (depending on your interpretation) the symbols associated with Passover, but still told his followers to continue keeping it “in remembrance of me” (Luke 22:19; 1 Cor. 11:23-26). For New Covenant believers, Passover reminds us of God’s deliverance and Jesus’ sacrifice. Drinking the wine and eating the bread symbolize our commitment to and participation in the New Covenant. Passover also lets us “proclaim the Lord’s death until he comes” (1 Cor. 11:26, WEB). It is a way for us to keep in mind of, and remind others, that Jesus died for our sins and that He will return. Beginning the day after the Passover, the Feast of Unleavened Bread (Chag HaMatzot) lasts for 7 days. The first and last days are both holy convocations and days when we do no work. For all 7 days, we eat nothing with leavening in it and eat unleavened bread (Lev. 23:6-8; Ex. 23:15). As we can see in this quote from Paul’s letter, the early New Testament church was still keeping this Feast. They were doing so in the spirit as well as the letter, recognizing that there’s a purpose behind the symbolism of putting leaven out and taking in unleavened things. These days are a yearly reminder to keep putting off sin and putting on Christ’s nature. On the Sunday after Passover, ancient Israel performed a ceremony called Firstfruits or Wavesheaf (Lev. 23:9-14). From that day, you count seven Sabbaths plus one day to get 50 days, then observe the Feast of Weeks (better known today as Pentecost or, in Hebrew, Shavuʿoth). Pentecost is a fascinating holy day. It’s connected with the story of Ruth and our role as firstfruits in God’s harvest. It’s the day Jesus and His Father gave the previous gift of their Holy Spirit to the church. It’s also the only single day called a chag (the other holy days designated “Feasts” are the 7-day long Unleavened Bread and Tabernacles). There’s a great deal of significance in this day, and it’s there for us today as well as for earlier believers. There’s not nearly as much information in scripture about the Day of Trumpets/Shouting (Yom Teruah) as for the other holy days, but that doesn’t mean it’s any less important. Many believers, and I think rightly so, see it as the holy day which points to Christ’s return because of the connection with trumpet blasts (1 Thes. 4:16; Rev. 11:15). It’s one of the “shadows” speaking to us of Christ’s reality (Col. 2:16-17). The Jews consider the Day of Atonement (Yom Kippur) as the most solemn and holy time of the year. It was the only day a human being could enter the Holy of Holies inside the temple, and even then only the high priest. There was also a ceremony of two goats — one killed for the sins of the people as a picture of Jesus Christ and the other banished as picture of what will happen to Satan (Lev. 16; Heb. 2:17; Rev. 20:1-3). Today, Atonement reminds us of Christ’s sacrifice, looks forward to a time when Satan is removed from the picture, and invites us to think deeply about our High Priest Jesus Christ. It’s also the only specific day we’re commanded to fast, which in itself as a whole host of spiritual benefits. The Feast of Tabernacles or Booths (Sukkot) is a week-long feast with an 8th day, the Last Great Day, on the end (Lev. 23:33-36; 39-44). It was a Feast that Jesus kept (John 7:1-10; 37-39), and this prophecy in Zechariah shows it will still be celebrated in the future. This Feast is a season of great rejoicing, followed on the 8th day by a solemn observance called an atsarah (click here to go to last week’s post on Hebrew words associated with the holy days). Tabernacles reminds us that we’re strangers and pilgrims on this temporary earth, but that a time is coming when God will establish His kingdom here and all people will live in His peace. This is a long post, but it’s just the briefest overview of the days God calls holy to Him. These days offer a weekly (in the Sabbath) and yearly (in the annual Feasts) rehearsal of God’s plan. He invites — and commands — us to keep these days with Him on His set appointed times because they matter. We keep His Sabbaths because He is Yahweh — the eternal Lord and the only true God. These days mean something to God, and therefore should mean something to His children. 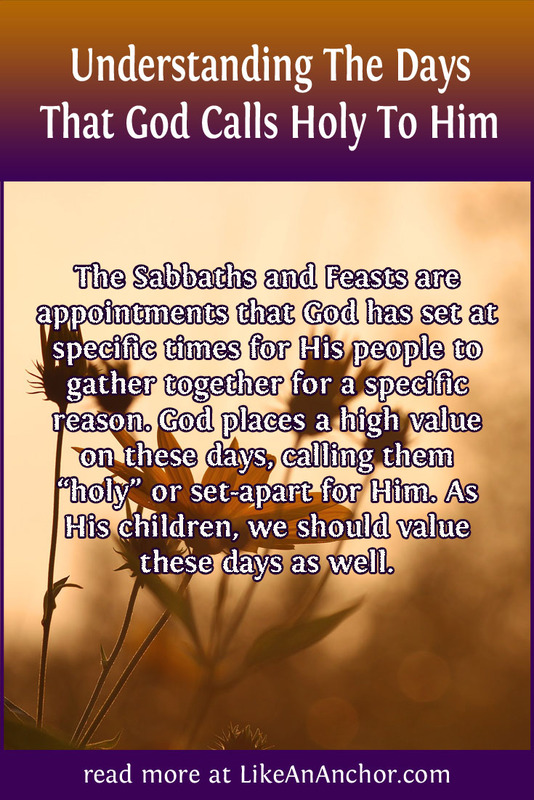 The Sabbaths and Feasts are appointments that God has set at specific times for His people to gather together for specific reasons. God places a high value on these days, calling them “holy” or set-apart for Him. As His children, we should value these days as well. ← Why Is It So Hard For Certain Personality Types To “Just Get Over It”?